For Joseph Bauer growing up, it was never an option to run away and join the circus, he was already there. In fact, for eight generations, his family has been a part of the circus. This year his daughter is on the tour with him, extending the family tradition another generation. The Royal Canadian Circus SPECTAC 2016, is coming through Drumheller on Wednesday, May 18, and Joseph Bauer is the ringmaster. “My family originally comes from Switzerland, and they came in 1953 to the Greatest Show on Earth, the Ringling Brothers, Barnum and Bailey and became American citizens not long after that and toured throughout the US,” he explains. He said his family originally performed on the sway poles, a traditional circus acrobatic act. They continued with other acts and producing shows for world fairs and even Disney. Bauer himself will be performing in the Giant Wheel of Destiny on this tour. Besides Joseph, he has a sister who is married to Tarzan Zerbini, who owns their own circus. His wife is an equestrian and his niece is also performing. “It’s a big family affair,” he said. “It is something that is in our blood. Performing in the air with my family is a highlight of my career.” SPECTAC! 2016, showcases an international cast including Anthony Pages flying trapeze, the wheel of destiny, Chinese pole acrobats, The Kambarow Cossack Riders from Mongolia, the Russian Swing and Romanian Aerialists, clowns and the Liberty Horses. Because of a permit hold up at the border, there will be no elephants performing in the show. 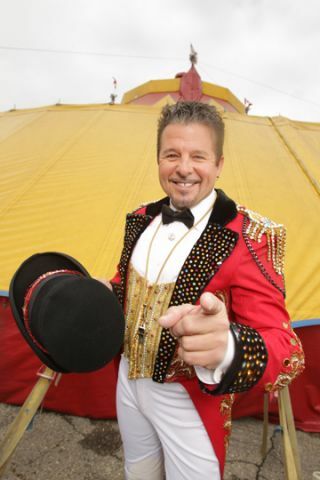 “The circus is still the oldest form of family entertainment, it’s older than baseball,’ he said. Over the years the circus has reinvented itself with resurgence of acts such as Cirque du Soleil. There have also been changes of attitudes in regards to the use of animals. This year the Ringling Brothers Barnum and Bailey have removed elephants from their tour. “Our elephants have a 100 acre property right outside of St. Louis and half of the year they are roaming the hills of Missouri,” he said, “We really love these animals, they are part of the family. He adds they raise awareness and funds to support the Asian Elephant Support throughout the tour. The Royal Canadian Circus SPECTAC! 2016 is set for two shows at the Drumheller Memorial Arena on May 18 at 4 p.m. and 7:30 p.m. This is the 253rd Anniversary of the Zerbini Family Circus. Since the humble start of the Zerbini Family Circus in Paris, France, in 1763 ten generations of Zerbini’s have travelled the world sharing their talents with circus audiences on three continents. Visit the Zerbini family run elephant care and retirement facility in Gainesville, Florida http://www.allaboutelephants.com.